Custom Hand painted Furniture In Designs Of Your Choice. Email me to get a price quote to custom order hand painted furniture. We first want is to get an idea of what the customer really wants. We provide hand painted designs to the customer or they email us photos of ideas of their own. We take into account the customer's personal interests and color scheme. 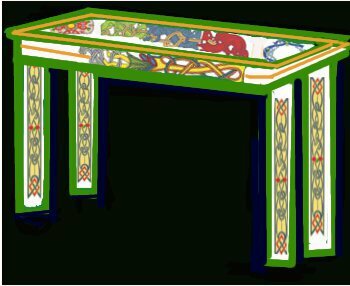 We then provide drawings of hand painted furniture pieces for approval by the customer. Clearly Susan is proud to offer hand painted furniture for every room of the home or office. We have kitchen stools and bar stools, chests and trunks, end tables, sofa tables small writing desks, chairs and so much more. We create custom furniture of your choice from unfinished wood furniture. If you want a particular piece that we do not have we can send you picture samples and try to find the furniture piece you want. We next will order the solid wood furniture from our vendors and begin the process. We prime the wood with a base coat and then paint with a color of your choice. We can stress the wood to make it look old, use a faux finish, glaze what ever you like, and then we paint the furniture with your design. After that we paint it with a sealer. It is that easy. Have your favorite furry friend hand painted on a plate or platter, wine glasses or ornaments. Just email us a picture so that we can get the exact details of your beloved pet. We would love to hear from you as we love animals, too, and what better way to preserve their picture forever then to have them hand painted on a plate or platter. We have such a loving relationship with man's best friend. 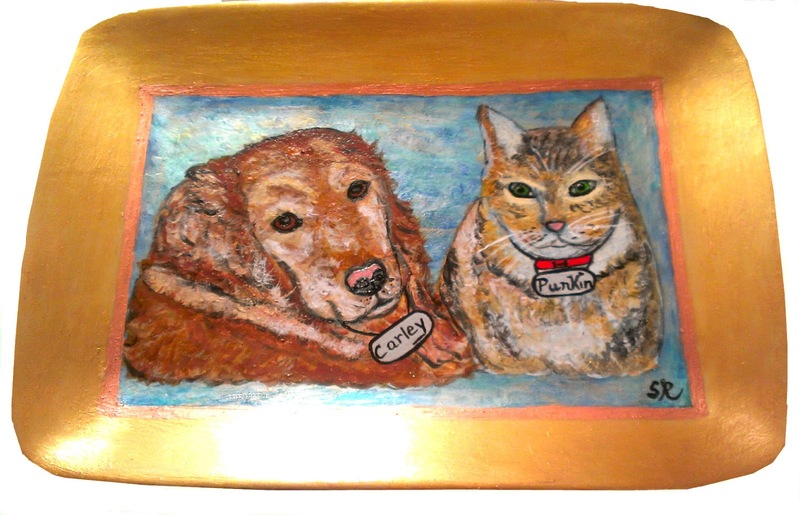 A painted dog and cat plate and platter is a wonderful gift to give to someone.